The Level 3 Diploma in Business is a 60 credit Ofqual regulated qualification and is the equivalent level to an A Level or Access to higher education qualification. Learners must complete 4 mandatory units worth 60 credits to achieve the Level 3 Diploma in Business. 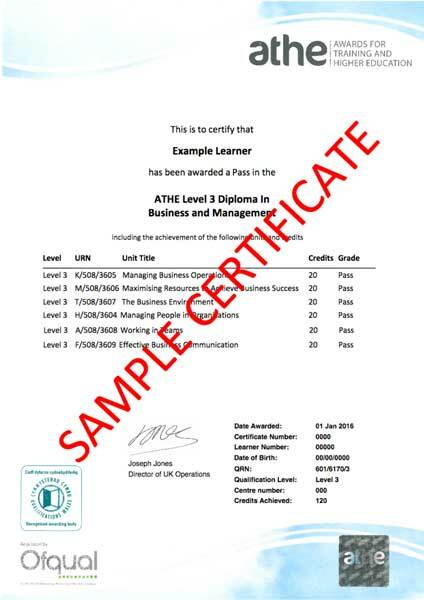 The ATHE Level 3 Diploma in Business is a 60-credit Ofqual regulated qualification and is the equivalent level to an A Level or Access to HE qualification. It has been designed for learners who wish to progress to a business or management degree but may not have the traditional entry qualifications usually required. We also offer a larger, 120-credit qualification in Business and Management at this level.